Donna Ulisse thanks Del McCoury! 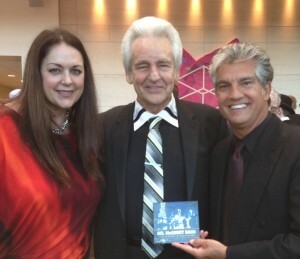 Donna and co-writer Jerry Salley recently caught up with bluegrass icon Del McCoury in Raleigh, North Carolina at the International Bluegrass Music Awards to thank him for recording their song, “Butler Brothers” on the new Del McCoury Band CD The Streets of Baltimore. The CD was released on September 17, 2013 and is already receiving heavy airplay and stellar reviews. Butler Brothers is a song about two brothers fighting on different sides in the Civil War and the struggle of their mother having two sons in a war on opposing sides. It was inspired by real life documents Ulisse’s husband Rick Stanley got from a Virginia courthouse about his own family. To read more about the background on the song, visit the Bluegrass Situation to read an interview journalist did with Donna for a piece she was writing about the album.